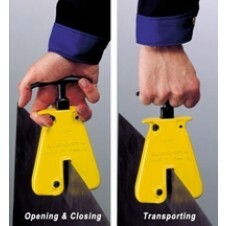 The Camlok HGC series of hand grip clamps are suited for the individual transport of light and thin steel plates. They have a jaw capacity of up to 10 mm and can lift up to 250 kg's. The Camlok HGC lifting clamp from Hoist and Winch is available with either a hand grip handle or eye bolt lifting point. Designed to lift thin steel plates with a maximum thickness of 10 mm and weight up to 250 kg.